I recently purchased the e.l.f. 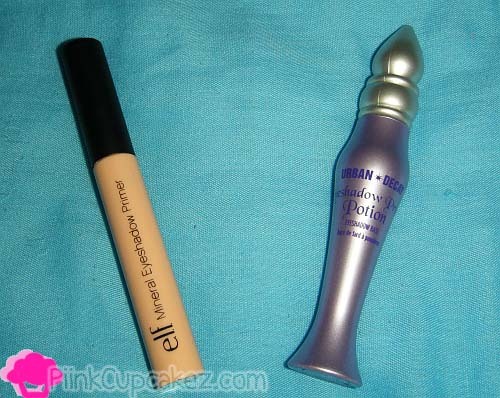 Mineral Eyeshadow Primer and decided to put it to the test against my Urban Decay Primer Potion. "This gentle and completely sheer Eyeshadow Primer has key vitamins A, C, and E to help prevent aging and moisturizes the skin. The formula glides on easily and disappears instantly to create longer lasting, crease-proof eyeshadow. The Mineral Eyeshadow Primer is designed to be used with your favorite Mineral Eyeshadow to provide ultimate staying power for beautiful and vibrant color that lasts." 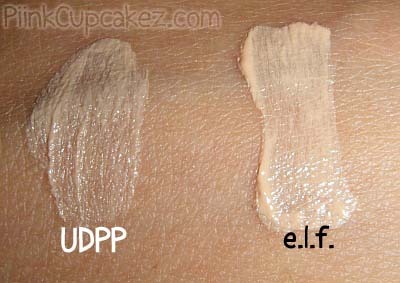 One thing I noticed right away is that the consistency of UDPP is creamy while the e.l.f. Primer is more liquidy. This makes it very easy to spread and you will only need a small amount to get the job done. Both primers give eyeshadows the same amount of intensity(I didn't notice a difference) and blending is rather easy. Although there isn't much difference in how vibrant they keep your eyeshadows, UDPP definitely has a better hold. I swatched both primers on my hand with an eyeshadow over each and then rubbed them with a tissue. The e.l.f. swatch disappeared while the UDPP was hard to rub off. I did this with mineral and regular eyeshadows and got the same results. I applied UDPP to one eye and e.l.f. to the other. Then, I did my makeup and waited to see just how well the e.l.f. would last through out the day without creasing. All of these pics look exactly the same lol. As you can see the e.l.f. Primer is still looking good at the 10 hr mark. After 10 hrs it did start creasing and around 11 hrs my eyeshadow somehow got onto my eyeliner. Urban Decay claims their primer lasts 24 hrs which I wouldn't doubt. There have been a few nights when I've fallen asleep with my makeup on and my eyes were still looking perfect the next day. The e.l.f. Primer will probably work even better on someone who doesn't have oily lids like mine. I'll use this when I don't plan on wearing my makeup for long periods of time and pull out my UDPP for the serious stuff. This way my UDPP will last me a lot longer. Since this is a $3 primer I would suggest that everyone try it out and see if it works for you. It's a lot better than spending $19. What's your favorite eyeshadow primer? Hey lil momma! Thanks for this review. I'd like to try it as well. Did you find the elf primer in stores? @Dwana - Hiii! no, I ordered it from the e.l.f. site.. I haven't checked in stores. Thank you for the comparison review! My hg primer is udpp but to save money I got the $1 primer from elf and it works pretty good so far, I'll have to try the mineral one and see if it's better. I am so getting the elf one since I will be wearing more eyeshadows for this school coming semester. I dont really wear eyeshadow, so have only tried one primer, heard great stuff about the urban decay one. I just bought ELF's regular eyelid primer so although I didn't purchase the mineral one, it was still interesting to see what you had to say. I'm planning to do a similar post within the next few days as well. You always do such a great job with your eyes and are such an inspiration! Thanks for your tips & pictures. Great review! I don't even wear MakeUp that long during the day, so the elf will be just fine for me! Love your MakeUp btw!